Helichrysum are related to the sunflower although are a very different looking plant. Used widely as garden plants some varieties are also used for extraction of the essential oils which are used in aromatherapy. Like the sunflower and prefer a well drained sunny position and a humus rich moist soil, however many species are very drought tolerant as well. Helichrysum is a large and varied genus that includes plants such as H. italicum or ‘Curry Plant’, while H. italicum is used for the Essential Oils. Although it carries the common name ‘Curry leaf’ it is not used in curries at all. So with over 500 species in the genus occurring from Africa to Australia this is indeed a varied group of plants, however they in general do cope well with poor soils and require good drainage. 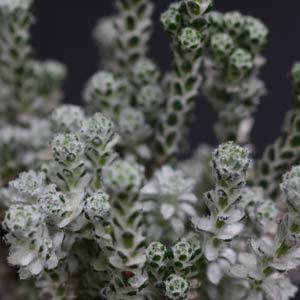 A few unusual species can also be found including Helichrysum coralloides, a species found on rocky areas in dry mountainous area of New Zealand. In terms of landscaping and horticultural us plants such as Helichrysum petiolare or ‘Limelight Licorice Plant’, H. bracteatum or Strawflower, H. angustifolium which is also known as ‘Curry Plant’ and the cultivar H. thianschanicum ‘Icicles’ are all widely used. Most species grow well in full sun in a well drained soil. H. elatum (syn. Coronidium elatum) is known as the ‘White Paper Daisy’ . Tall growing often to over 1m in height. H. argyrophyllum is a yellow flowering species that will grow well in very dry areas with poor soils. H. leucopsideum is known as the ‘Satin Everlasting Daisy’. H. petiolare is also known as the licorice plant. Helichrysum are suitable for growing in pots or rock gardens and do well in coastal conditions.